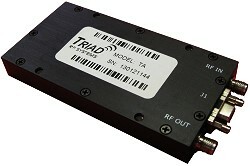 October 5, 2017: Triad RF Systems announces the TA1167, a compact 5 W amplifier suitable for COFDM video links in the UAS and DTV broadcast space, covering 6,400 to 7,100 MHz. It's compact, efficient, design allows for camera-back installations or other applications that are SWaP constrained. 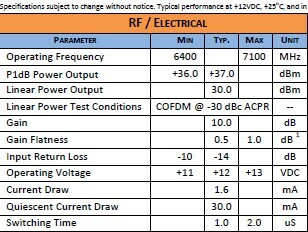 The amplifier is capable of 1 W COFDM meeting -30 dB ACPR. Features include: Over / Under / Reverse Voltage Protection, Optional Heatsink, High Speed On/Off Control, and Thermal Shutdown.